Another whisk shot. 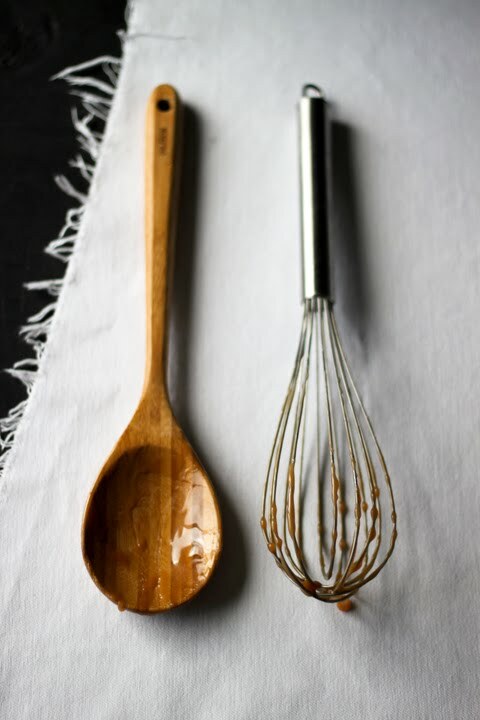 Whisks are that magical utensil that I'm gathering quite the obsession for. I found a few old whisks while looking at antique shops on a trip and they were all so unique. One was shaped like a heart, the others like eggs. 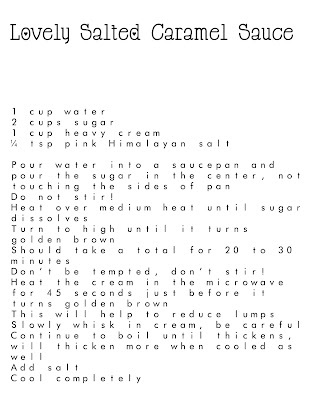 So you probably assume that this recipe is to accompany some kind of cake, ice cream or something like that? Well that would have probably been a good idea but we just ate it straight out of the jar. When warmed it is a sauce but at room temperature, it is like eating very soft caramels. Your blog is so beautiful! 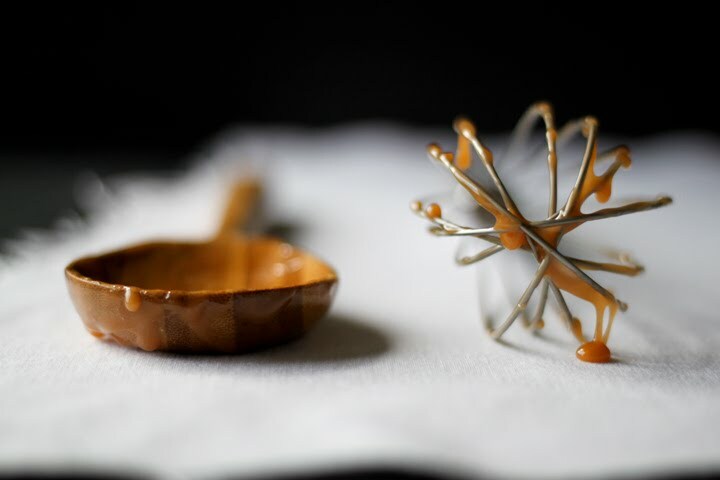 This caramel sauce looks divine. This looks wonderful! How long will it keep? Thanks. Ohhhh yum! Again, stunning photography!! If I had this in my fridge, it would be very, very dangerous, indeed. Yum! I look at food photography everyday....your photos are spectacular! I just found you and I think this discovery could be problematic. Your caramel sauce looks so divine I'm struggling with the urge to lick my screen. beautiful pictures! and i'm totally trying this caramel sauce!! I'm interested in making this for wedding favors. How long will it keep if not refrigerated in a mason jar at room temperature. I'll have to make it the week before. I've just sent my husband to the shops for cream. Wish me luck for my late night cooking! Mmmmm looks delicious!! Also found you thru pinterest...couldn't resist the beautiful photo of the jar of salted caramel sauce!!! i'll be trying it for sure! thanks for sharing your gift! Well Julie Marie...I've made the sauce...burnt th first batch in the blink of an eye...went straight to the second batch...mmmmm!!! Now made it about 4 times..have a batch in the fridge right now that I just 'visited'! lol...and I've just blogged about me making it (I added butter...which is kinda funny considering your blog name! ;)) and I've posted a link to your site. Thanks so much for sharing...sooo delicious! Made this today.... so easy! 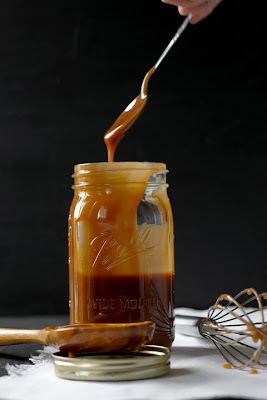 I have been avoiding making caramel sauce my whole life coz I thought it would be difficult, but you made it seem so simple! Thanks so much! 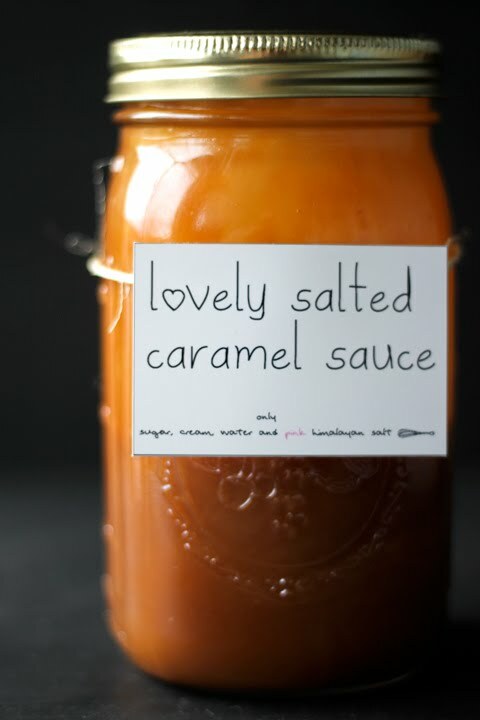 I have made some brown sugar cupcakes and I am going to fill them with this sauce. Mmmmmmmm! There _is_ butter in this sauce - well, at least it contains the ingredients required to make butter. "There's only one thing that's better than butter, and that's more butter." What is pink himalayan salt, and where do I find it? I also have not heard of pink himalayan salt, same question. You can find the pink himalayan salt all around. I saw some at target the other day in the spice aisle. My mouth is watering - the recipe sounds fabulous, but it was the photos of the gooey, drips of caramel from the whisk that got me salivating. I have a brother who is a pastry/dessert chef and has always made a to die for caramel sauce, which is to be drizzled (ok....poured) over his apple dumplings. I'm thinking this could outdo his recipe!! Thanks for posting on Pinterest!! I gotta ask- my batch crystalized :(. What did I do wrong? It still tastes good, but obviously not a great texture. I've never made caramel before so I just knew I was going to screw it up! I've made 2 batches now, and they've both crystallized, too... I made sure the sugar didn't touch the sides of the pan, and definitely didn't stir, but apparently I did something wrong!!! 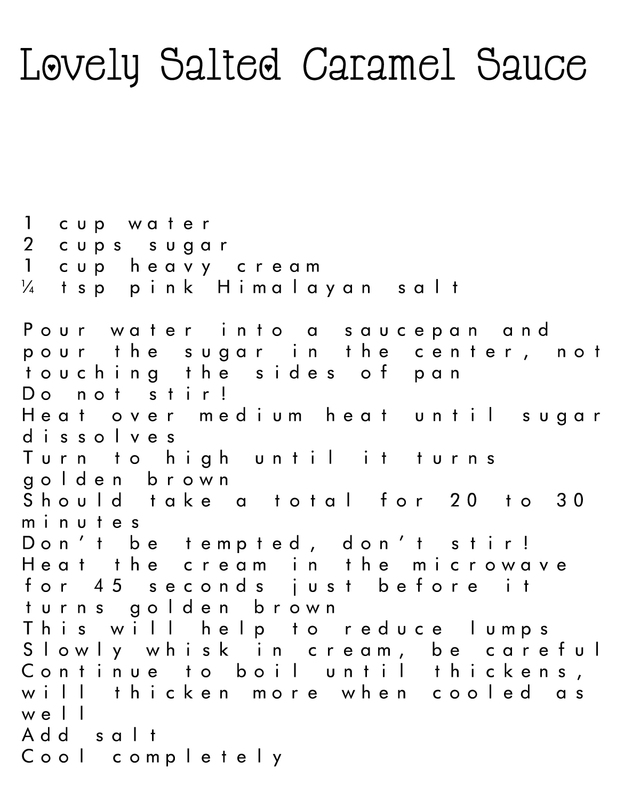 Can this recipe be substituted for melting a bag of caramels in another recipe I'd like to try....would the consistency be similar?? I'd rather use something homemade than from a package? Hi just wondering-- I was going to gift a batch to a friend with some ice cream bowls and a scoop-- is it ok for it to be out of the fridge for a long drive? I am relatively new to the caramel sauce making party and have run into a bit of a snag with my sauce getting grainy. What can I do to prevent this from happening? where would I find the pink himalayan salt? It looks so good and would love to try some! I just made this and it is not a sauce. It's the consistency of maple candy. Did I cook it too long? Made this last night - so delicious! I too just eat it out of the jar...it's dangerous having it in the fridge! Just made it... Can't wait to try it!!! Mine sugared as well...consistency of maple sugar candy. Don't want to waste the time to try again until I see if there is a solution here. Can you use normal table salt instead of pink Himalayan salt? Or will that mess up the caramel? Hm looks delicious! !i'll be trying it for sure! thanks for sharing your gift! I think I have a cheesecake this sauce needs to go on. This looks so good. I didn't have any heavy cream, so I tried it with evaporated milk and with milk and butter. The one with evaporated milk burned (tear!) but the one with milk and butter is still really good!! Just so everyone knows there's a substitute. Thank you so much for posting this recipe! It is delicious! And your instructions were terrific! Thank you! Made my first batch yesterday and I burned it - I was using the 20 minute time frame and in a blink of an eye it turned VERY DARK. Attempted a second batch and this one crystalized after cooling. In fact, it's hard. I can put it in the microwave to liquify it, but you can definitely taste the sugar crystals. What the heck am I missing? I'd love to try it again but don't know what I could do differently. HELP! I think a HEAVY, evenly heating saucepan with a large enough area to keep the sugar off the sides is important. I used the base to an older pressure cooker the second time, and it cooked much slower, but turned out perfect! The first batch I used my standard non stick large saucepan.....and it scorched quickly. Any ideas how soy or almond milk would work? Should I try unsweetend or vanilla? I don't believe soy or almond would work because they do not contain the butter fat as the cream does. You may try to add real butter (not margarine) but probly not an option if you're looking to go dairy free. I don't own/use a microwave. Would you just heat the cream on the stove top? Does the cream turn golden brown? Does that mean it comes to a boil and cooks? Super easy! Who knew? It is amazing. Found it out Pinterest. Thanks for sharing it with us! I don´t get why so many people are complaining about the recipe... it's awesome! I don´t even own a thermometer (and my whisk is broken) and it came out fine, without any lumps in it. ok...attempt #1 and I'm left with a bowlful of what looks like very light sand. (hm substitution for malt powder, maybe?) I am undeterred. Trying again. It sure would be nice to have some answers, though. Attempt #2 success! And may I say, worth the initial struggle. I think the first time I made the mistake of keeping the caramel on the heat for too long after I added the cream. Really, once the cream has been whisked in (slowly), you can take the pot of the heat. The first time, I kept the mixture boiling and whisked like a crazy lady, thus stirring out all the moisture. Hence...powdered caramel. The second time, I let the sugar/water mixture get quite a bit darker and then added the warm cream. It is truly magical stuff. I would encourage you to keep trying! Adorable account. Helps make us need to be far better. Appreciate your sharing. You are great. I gave it a try and think I left it on the heat too long after the cream was added. The texture and flavor are lovely while cooling. After cooled, hard as a rock. Will need to try again with the tip of taking it off the heat as soon as the cream is turned in. Thanks for the recipe I can see it will be a favorite as soon as I master it. How long will this last if not refrigerated? thinking about making it close to Christmas time for gifts. Just made this and it tastes awesome. Not grainy at all but I did have trouble getting it to turn caramel colored, so it's vanilla looking but is soooooo tasty! I don;t have a microwave. Do you think it will still turn out right if I heat the milk in a sauce pan? The key piece here is the temperature of the sugar! If it's not hot enough it won't change color at all. As soon as it reaches the right temp it will brown FAST! (and burn if left there too long). Know your stove and cookware, I removed mine from the heat as soon as I started to see color. It doesn't really matter how you heat the heavy cream, you only want it to not be cold when you add it to the sugar. Don't overheat it though, it should still be white when you go to add it in! I made this last night- beautiful out of the pan, then I let it cool and put in a mason jar. I put it in the fridge and the next day it was totally crystallized. Help!! What happened? why are there no answers to these questions? I have made this a few times - here are my tips: you must use a large, heavy pan. Cook as instructed until sugar water turns a golden color, not brown. Turn off the burner and whisk in the warmed heavy cream but do it slowly and be careful - it will steam like crazy. Carefully pour into a hot mason jar. It will make one pint or 2 half pints. If you don't cook the sugar water long enough, it will be a vanilla looking sauce. If you cook it too long it will turn into a maple sugar and get hard. I heat the whole jar in the microwave for 20 seconds whenever we want to eat it and then put the jar back in the fridge. It will last for a month or longer without spoiling. Also, I think any salt will do fine. And you only warm the cream - you don't cook it to a brown color as someone above asked. Hope this helped! DISSOLVE SUGAR IS KEY. Slow and easy. The sugar will make little volcanoes and I did move the pot around to dissolve all the sugar. I have a glass top stove so you have to know your stove and cookware (thick bottomed). Might add a bit more salt next time! Hello Julie! Love this post and so many others - i just reviewed this recipe on my blog www.thepinteresteffect.com My blog vows to cover me executing 100 pins from Pinterest in one year - and your Lovely Sauce is on my list - THANK YOU! I hope you'll check it out and enjoy the review. Just made the sauce for a brownie topping + I have to say thanx for such a simple recipe that does not call for a ridiculous amount of butter. It came out perfect the very first time! This recipe is not specific enough for people who do not do this sort of thing. Right away my sugar touched the edge of the pan. Darn. I decided to go ahead and just see. Almost right after adding the cream I poured a little bit out onto a plate and left it while I continued to heat the pan so it would thicken a bit as the recipe says. I poured a little more on another plate and the rest in a heated Mason jar. After both plates were cooled the first one was nice and smooth and delicious. The second that I had continued to heat was tasty but grainy and hard. SO sugar touching the side of the pan was no biggie. Really! You need to read the comments! People are asking for help and getting none. Made this today! I am utterly impressed with myself! Part of the trick is to use a good quality thick bottomed pot that is large enough on the bottom to accommodate the sugar. I have a gas stove so putting the mixture on "high" heat was a little scary for me. After the sugar dissolved, I continued it on medium high and watched it like a hawk. I did not stir it. You *must* heat your cream before adding it. I added it s-l-o-w-l-y, right after I noticed the sugar mixture turning yellowish (golden). I whisked gently and added the cream in a very fine stream. It frothed, steamed and bubbled so I took it off the heat. It turned out beautifully, a dark caramel color. Of course added the salt last. It is a buttery, sweet and slightly salty treat. I am making this again and again! Good Luck! Should the saucepan be covered or not? I make a caramel sauce recipe that is similar to this one for my Candy Store and a few tips to remember. Cook slow and on a med temp if you want a dark caramel sauce. My recipe uses corn syrup which helps keep the sugar crystals from forming as well as some lemon juice. Use a silicon basting brush with warm water to wash the sugar crystals down from the sides of the pan. When I cook my sugar mixture I use a candy thermometer and let it reach 316. Then immediately remove it from the burner and SLOWLY add hot cream stirring sugar mix while adding cream. If the cream and sugar mix is not smooth when I finish mixing them I place back on the burner continuing to stir just until it boils again (less then minute) then immediately add and butter or salt that you want and stir. Then pour into mason jars, screw sealable lids and rings and turn upside down till compleatly cooled. Lids should seal. Mine keep with out crystallization on the shelf for about 2 to 3 weeks. Once its open it needs to be refrigerated. Hope this helps.